I taught two sections of first-year writing in spring 2016 under the overarching theme of "immigration." I assigned some fiction related to the American immigrant experience but spent quite a bit of time talking about issues in immigration policy. Our class was coinciding with the final months of the Republican primaries, and we were also bringing election politics -- the debate about illegal immigration -- into our earlier assignments. I had them read a series of Op-Eds relating to the immigration policy debate and also watch recaps of the primary debates. For the final month I decided to shift gears and help guide students to a research topic that was focused on a historical issue -- in this case, the Mariel boatlift of 1980, which led to more than 100,000 Cuban "undocumented" immigrants entering the U.S. over the course of a few months. I gave them quite a bit of background on the event and also showed them how to research aspects of it on their own using tools like Lexis-Nexis. We spent time in class workshopping paper topics as they were being developed by students, and then the papers were due in late April. In this class, I made the decision to give them a relatively tight set of constraints on the research paper – they were all working on a single topic. Within that topic there were many subtopics I charted out for them. Some were designed to appeal to questions about economics and policy (what economic impact did the rapid influx of 125,000 Cuban immigrants have on the Florida economy?) – designed to get the interest of the business majors in the room. Other subtopics were more focused on more cultural issues and issues of social justice. To what extent does it make sense to see Cuban refugees as undocumented immigrants along the lines of the conversation today? What were the experiences of LGBTQ Cuban refugees in the Boatlift like? Students picked out various subtopics, often in small groups, and worked within the broader framework I had selected. This approach -- where you give students a topic to research rather than let them pick their own -- is not one I would recommend for everyone. For one thing, it's very difficult to pick a topic that's neither too broad nor too narrow. You also don't want to seem that you're imposing your particular hobby-horse or research area on a group of unsuspecting freshmen. The advantage of introducing some degree of constraint is that you can set up a scaffolding for students -- and a base of knowledge they can draw on -- that means they don't have to go out entirely on their own. You also don't put yourself in the position of having to research a topic with which you yourself may not be super-familiar alongside the students. Finally, I wanted to pick a topic that would stimulate genuine debate, and allow students in the room who identify as conservatives as well as liberals to have something to grab onto ethically and intellectually. American conservatives have long supported an open-door policy towards Cubans wanting to emigrate, and Ronald Reagan's administration ultimately gave the vast majority of those immigrants green cards and then citizenship. How does that square with what conservatives think about these topics today? But the event was also seen as a disaster for Jimmy Carter's administration as it was occurring -- it forced Democrats also to reconsider their attitude towards immigration and hospitality and set the stage for the "New Democrats" who would emerge after Reagan (i.e., Bill Clinton). About two weeks after students submitted their research papers, I asked them to repurpose some of their research for a multimodal assignment. Finally, I asked them to present their multimodal projects live in class (4 minutes to present, 1-2 minutes for feedback and questions). We took two sessions to work through each of the projects. This is not something for everyone either – those two class sessions might have been used for something else. But I also felt there was something of value there, especially for several students in the class who were either shy or were not confident of their English-language presentation skills. Making them present and defend their research orally might be another “mode” in the “multimodal” assignment. Below is the text of the multimodal assignment I gave my students. I. What is this assignment? When is it due? The assignments are ‘due’ to me by May 2 (end of the day Monday) in the appropriate data format. We have two classes next week reserved for students to present their work. Since this isn’t a conventional paper assignment, it’s a little harder to measure than the others we've done so far. 1) Quality of multi-media material you create. Does your project tell us something we didn’t already know? Does it have the potential to add to the public debate over the issue at hand? Do you have a clear argument you are trying to get across with these materials? 3) Quality of the oral presentation. Next week, you all are going to present your work in class on Tuesday 5/3 and Thursday 5/5. The presentations should be brief (4 minutes or less of your presentation with 1-2 minutes of discussion and questions from your peers). In addition to preparing your materials you need to think about how you are going to present it and prepare some notes (for those of you who get nervous when speaking public, you may wish to write up a ‘script’). II. What is a multi-modal project? The University of Mississippi has a nice set of resources for multi-modal projects. I’m interested not just in Powerpoints, but in modes of presentation that might lead you to challenge yourself to experiment with some new skills and tools. One of the bullet points above talks about how this type of project can “help you develop a better sense of a real audience.” In other words, you are trying to produce something that ordinary readers might be able to learn from. Along those lines, I’m especially interested in having students do projects that translate material from your research papers (or from work we have done in class – more on that below) into formats that takes that material to the web. The slide presentation is a pretty standard way of presenting information that you will see in many other classes at Lehigh, and that you will see in workplaces later on in your careers. Powerpoints can be very effective ways of communicating information, but they can also be done badly. Many times people just use lots of bullet points in their Powerpoints without thinking about organization, and insert easy found images without thinking carefully about the visual design of their slides. If you take this path, I would hope that you would design 3-5 original slides and think carefully about the presentation of information. If you use visuals (say, graphs), I would expect that you made the graphs yourselves. If you use Microsoft Office (and all Lehigh students should have access to an MS Office license through the technology fee), the standard way to take given data and convert it into various kinds of charts is in Microsoft Excel. You can make the chart in Excel (go to “Insert” and then to “Charts”), and then export the image created to Powerpoint. Think carefully about what kind of chart might be appropriate to the data you have. 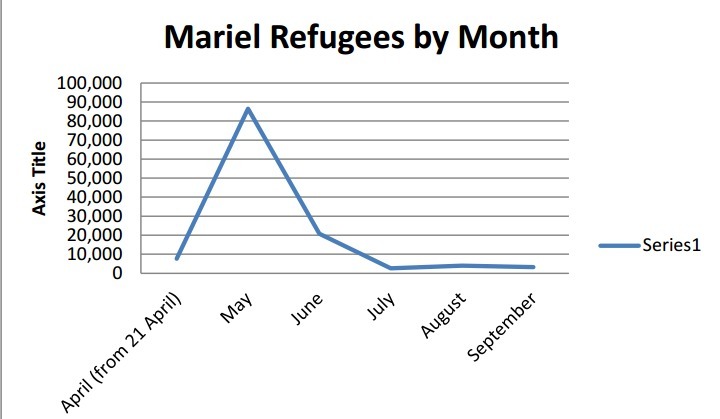 To take a very simple example of data we have already talked about, here are two charts with the same information that I created in Excel after pasting the data from the Mariel Boatlift Wikipedia page into Excel. Which is more likely to be useful? Answer: the line graph! But even here, it would be even more useful if we could get even better data to find out the numbers of refugees arriving, say, by week, and then index that to an event that led to the slowdown in the number of refugees. Note for Google Docs users: Google has a great cloud slide service called Slides. You can use it the same way you use Google Docs for writing papers. You can also use Google’s spreadsheet software (“Sheets”) to work with data and make charts that you can then paste into Slides. It’s pretty easy to use, though it doesn’t have all of the bells and whistles you’ll find with Microsoft Excel. A couple of you remarked to me in office hours that you found the images I showed you in a slideshow last week to be quite provocative and powerful (incidentally, I did that in Google Slides). You can curate a collection of images you think are interesting and that tell a story (or make an argument) about the topic you are working on. You can ‘narrate’ while cycling through the images with a set text associated with each image. In class, you can read the narration aloud while cycling through the images. If you take this approach, you can also try a hybrid of journalistic photographs and charts/data depending on what you’re focusing on. If you’re mainly working with photographs, you might end up doing more than just 3-5 slides. The idea is to do structure a presentation that will take about 5 minutes. But keep in mind that less is often more (the Instagram rule!). A smaller number of images that really pack a punch is better than a glut of images that don’t tell a coherent story. If you have experience working with video production software like iMovie, you can also build the slideshow and record the spoken word narration over top to produce a short movie (3-5 minutes). The advantage of this approach is that you can upload it to YouTube. And in class, you don’t have to speak live in front of your peers! Doing a Google images search does lead to a fair number of images, though you have to sort and sift them pretty carefully to find ones that are valuable or interesting. You also have to be careful of mislabeled images when you do this. With the Mariel boatlift, one thing I discovered as I was preparing to teach this material to you was that there isn’t really a comprehensive resource available online that compiles all of the different aspects of the boatlift we have discussed in a single place. The Wikipedia page for the Mariel Boatlift is pretty decent, but there are many aspects of the boatlift (for instance, the gay/lesbian population) that it doesn’t really address head-on. Editing a Wikipedia entry is not that technically challenging. The part where you want to be very careful and thoughtful is in the actual writing and organizing of information you are thinking about adding. 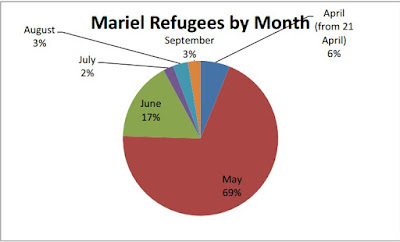 You need to look at the various sub-headers for “Mariel boatlift” very closely and think about where your contribution belongs logically, and then where to place it in the flow of paragraphs so that it fits in correctly. You do not need to know any coding or web developer stuff to put together a simple web page these days. Wordpress.com and Blogger.com allow you to put together free websites pretty easily using built-in design templates. And you can add material pretty easily using a framework that is only about as hard as sending an email. Typically you want to break text up into shorter blocks – with a short summary on the ‘front’ page, and additional material on pages that are organized in a way that will make sense to the reader and be easy to navigate. Timeglider is interactive and ‘zoomable’, meaning a user can approach the timeline aiming to get a general overview – or drill down deeply to see how events transpired at a very fine level of detail. If you create a timeline in Timeglider, you can decide which are the most important events and make those appear larger. The less central events can be smaller. Again, you can use the timeline we worked on together as a starting point for this (at the link above; there’s also a link on CourseSite). If you go this route, my expectation is that you’ll edit and curate the information here (and probably add to it… it’s by no means complete) to make it as useful as possible to people unfamiliar with this subject. That means you need to write a brief paragraph introducing the project as a whole. You might also select a handful of images to go with individual entries on the timeline. Take statistics and tables from some of the material we either looked at together, or from research you did on your own, and turn those statistics into graphs (or “infographics”) that show us something we might not see immediately. Infographics are a growing part of the media landscape. They get picked up quite a bit on social media and sometimes start to contribute to public perceptions of a given issue in some powerful ways. The idea is to use the infographic to make a visual argument. You can also print them out and display them as posters for people to look at in public places. Newspapers and magazines love to use infographics. Let’s look at a few infographics that relate to immigration (see slides). How to do this: There’s a free web tool called “Infogr.am” that you can play around with. It doesn’t seem that hard to use. 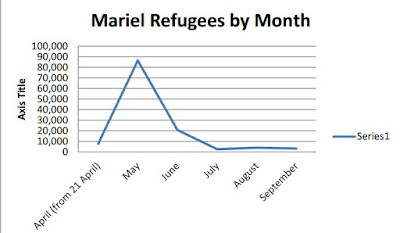 Here’s an example of something some of you might want to try: Construct a simple visual timeline of the Mariel Boatlift that indexes the sudden rise and drop in the number of Cuban refugees by specific political events. You might mark the events on one side of the timeline and the numbers on the other side. If any of you have experience using graphic design software like Adobe Photoshop, you can put that experience to use.